Want to see a photo of American’s new Boeing 777-300ER? 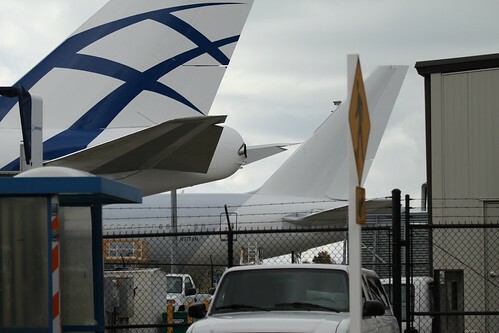 Paine Field in Everett, Washington is one of Boeing’s testing and production facilities in the Seattle area. Photographer Matt Cawby has been plane spotting and keeping up with Boeing’s activities at Paine Field since 2008 and sharing them on his KPAE Paine Field blog. Yesterday he posted a photo taken by aviation photographer Russell Hill of American’s new 777-300ER on the flightline. Here’s a link to the photo. It’s grey and looks to be coated with some kind of primer or protective finish, there’s no suggestion of the final livery…maybe it will be delivered unpainted, with the familiar polished silver finish. What do you make of that? Is it going to be grey with a white tail? Is that just a protective coating? Hmmmmm. What we do know is that American’s 777-300ER will feature completely new cabin interiors and that it’ll start service December 13 on the route between Dallas-Ft.Worth and Sao Paulo. I guess we’ll just have to wait a little longer to find out if it’s going to have a new livery. Still, it’s exciting to see it out of the factory! And how does anyone know it’s an AA plane? @ Patrick – That’s a good question, thanks for asking. If you look very closely at the photo you’ll see the registration number N717AN. That number is registered to Boeing and has on file a pending registration with AA.